Tip: Taking even a short walk can re-energize you and help you leave work behind for the evening. You will feel better if you get it out of the way right when you walk in the door. 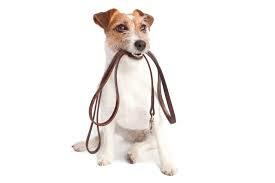 Have the leash and shoes waiting and just do it! Or try walking before work if that is possible. A little walk in the morning always helps make a day brighter. Tip: Each week take a look at your schedule. Ask yourself "when could I squeeze in a 15 minute walk?". Put a few walks on your calendar: Date with Buddy. C'mon you can do it! 3. My dog gets plenty of exercise in the yard all day. Tip: When a dog is left in the yard, most of the time all they do is sleep. Dogs are pack animals and want to be with you. Going for a walk is a lot more than exercise for a dog. Think of it as "reading the newspaper". Dogs love to cruise the neighborhood, sniff all around and mark their territory. It's also special bonding time with you that they may not get any other time of the day.